Anne wrote some weeks ago about Christmas Bazaars here in Helsinki. I think the best bazaar is Tuomaan Markkinat, which is situated in Senaatintori (along the Aleksanterinkatu). It is very beautiful place – Helsinki Cathedral is just next as well as Helsinki University and other old picturesque buildings. At Tuomaan Markkinat I recommend to stroll around and admire all different handicrafts, Christmas foods and Finnish specialities. Many of them are very reasonably priced so you can also buy great gifts for Christmas. If you have kids, they should try carousel. And when feeling cold, try some warm drinks! Tuomaan Markkinat will be open until 22nd of December so there are still some days left. This time I bought some woolen stockings – very warm and useful for those cold winter days we are still waiting for. 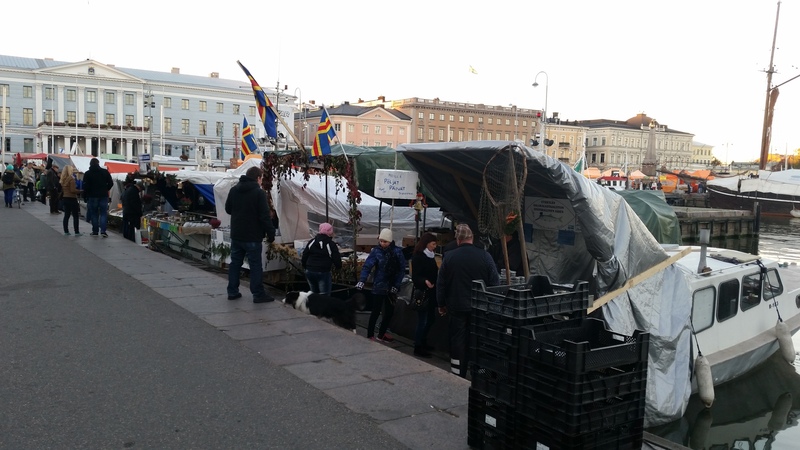 I visited Helsinki Baltic Herring Market a couple of days ago in Kauppatori (Helsinki’s market square at the beginning of Esplanadi park, in front of the Presidential Palace). Helsinki Baltic Herring Market is a traditional event that’s organized in Helsinki every year, usually in the beginning of October. It’s been in Helsinki forever (or to be more accurate, according to their website the event has been held in Helsinki since 1743). So it most definitely is the eldest fish market event in Helsinki, if not in Finland. Every year fishers from all around Finland come to Helsinki selling all sorts of marinated and pickled baltic herring products and fish. Some fishers sell directly from their boats but there are also small booths in the area. There’s also a competition for the best fish product of the year, but I actually missed the winner this year. 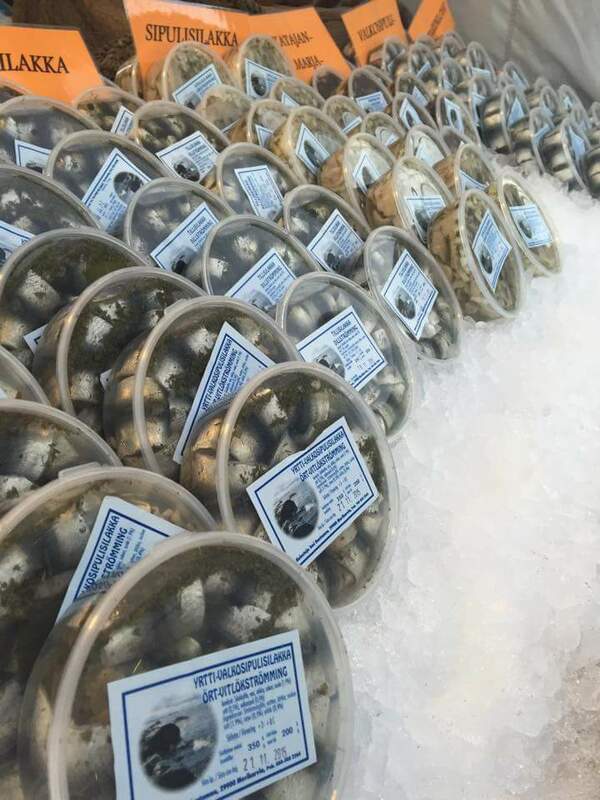 The sellers are more than happy to recommend you their best sold products or personal favorites from the selection of marinated baltic herrings. Baltic herring isn’t the only thing sold at the market. 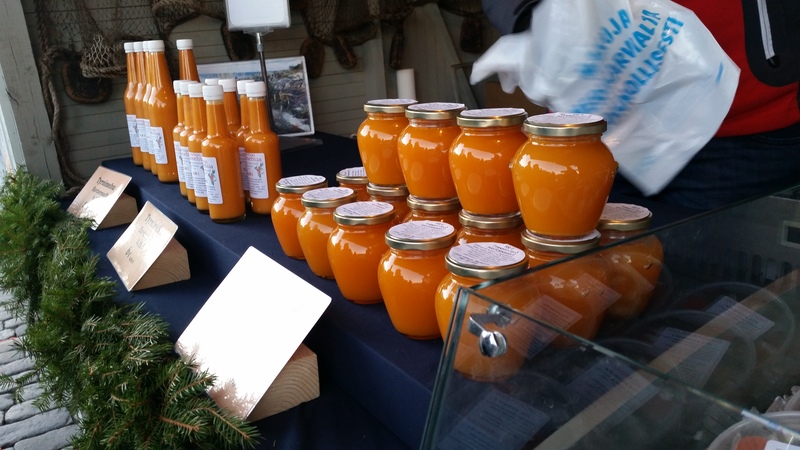 There’s also a good selection of Finnish handicraft and delicacies such as smoked salmon, fried vendace, honey, juice made form sea buckthorn berries, traditional fish soup etc. This year there was also a tent that served finnish school meals during the day, but I was at the market a bit too late to reminisce my youth. I have to admit that I’m not a huge fan of baltic herring, but I do eat it occasionally. For example pan fried baltic herring with mashed potatoes is not too bad. We used to have it at school quite often when I was little. You could try them for example in Salve restaurant right next to Hietalahti market square (the market square with flea market Anna wrote about a couple of weeks ago). But since I absolutely love the atmosphere at the Baltic Herring Market and think you should always support things you enjoy and like, I ended up buying a couple of jars of marinated baltic herring. One was flavored with juniper berries and the other one with garlic and creme fraiche or mayo. I haven’t tasted them yet but I think they’ll be excellent with a nice loaf of rye bread.